I like this case, the aesthetics, the compact form. It's not a 5-star case cause the average cable management. The plastics are good, but the metal cage feel cheap, it flex easly when you mount the front fans. There are rubbered feets for PSU. For a 40$ is good case. Great case for the price. Also comes with customizable trim colors - red, black, and white which you can swap out any time. Drive Bays: Only room for 2, 3.5" HDD's and 1, 2.5" SSD. Cable routing: Very little room for cable management in my experience. Only available from behind the motherboard tray. Dust filters on the front and bottom. Pre-installed with one black fan (3-pin, 120mm) in the back. The front allows 2 more 120mm fans which I used. 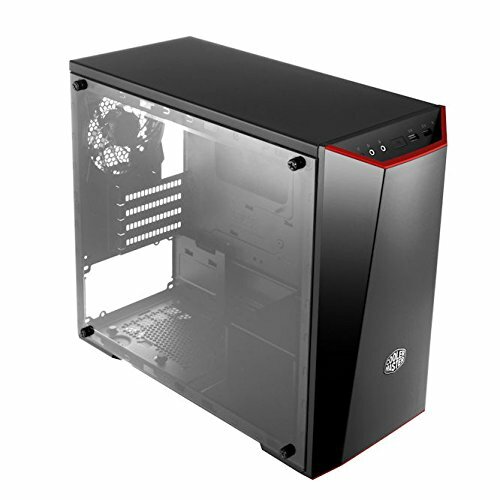 The case supports only Micro-ATX and Mini-ITX boards. In the future, I would get a case with more cable-management capabilities and more room for storage drives. Good looking case, like the changeable colored edges. Though the cover for the ports on the back didn't fit with this case. Pros: - Affordable Price At $27.99 USD AR, this is one of the best cases at this price point. Good Build Quality Case feels and looks very premium, screws and standoffs are strong, dark mirror is nice to look through. Customization The custom Red/Black/White Trim colors give the builder more control over their computers theme. Cons: - Dust Magnet Apart from the hairline scratches that come with the DarkMirror, the DarkMirror is a huge dust magnet. I'm not sure if it's due to the static that the DarkMirror has, but dust and pieces of hair will fly right on it and stick to it until you wipe it off. Cable Management Cable Management was not pleasant at all in this case. Even after managing the cables for an hour or two, tying every single wire & cable down and out of the way, the door panel still had trouble closing correctly. The door has far too little space, it needs to be a little larger. Only one 2.5" Drive The Case only has proper room for only one 2.5" Drive. USB 2.0 & 3.0 What's the point of (1) One USB 2.0 and (1) One USB 3.0? Just more cables to work with. Other Thoughts: For this price I can't complain too much, but I expected more from a company such as Cooler Master. This case has been a lot better to build in compared to other cheaper Rosewill/DIYPC cases, however some of the cons really need to be looked at by Cooler Master and improved. from completed build First Actual Build. I love how small the case is. But the only thing I wish they would of done is make the side tempered glass instead of plastic. Other than that great case. Good case, wasn't hard to build in. The side panel isn't clear like the photos would indicate, it's actually tinted quite dark and makes it difficult to see inside the case. Like other reviews have stated, this case attracts hair and dust like crazy. Keep it off the floor or the plastic view panel will quickly become dirty. The standoff screws for the motherboard wouldn't install correctly, after 20-30 minutes of carefully trying to screw them in without damaging the case, I gave up and just re-threaded the back by forcing the standoffs in. This shouldn't be necessary.